Instant messaging apps are available for Android and iOS powered smartphones and tablets, and it has become prevalent in recent years to the extent that, in many cases, it has replaced SMS as the primary means of sending quick, succinct written communication which requires instant notification and response. It is a marvellous concept and it grants quick access to people without needing to ask for their phone number, something which many people can be justifiably reluctant to give. However, as technology advances, so does the complexity of the means through which hackers can infiltrate or intercept messages that are supposedly private. The best-known instant messaging apps such as Facebook Messenger, WhatsApp and Viber can all be easily infiltrated by hackers with no shortage of technical expertise, so it is well worth considering a more secure alternative instead. In the infographic below, ERS IT Solutions identified six of the most secure instant messaging apps that you can download. With each of these apps, any messages sent can only be read by those for whom they’re intended, as the messages are encrypted to such a degree that even hackers would be unable to decrypt them. 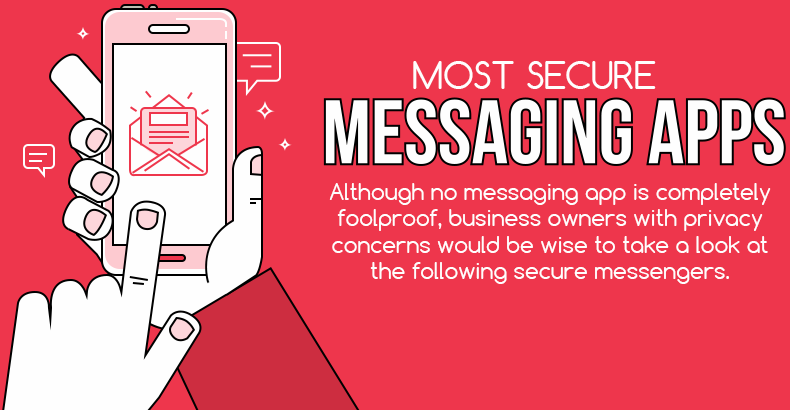 What are the features that make these messaging apps so secure? One of those profiled, Chatsecure, doesn’t require any personal data to set up an account, a very good starting premise for a secure messaging platform. Gliph, another app to make the ERS cut, allows you to permanently delete messages not only from your end, but from all those involved in the message, and enables the use of a pseudonym for informal chats. Silent Phone goes even further by granting encryption keys only to subscribers, meaning that not even the company can access the data in your messages. Private messages should befit that description, but with hackers better equipped than ever to access confidential information, only the most secure apps and programs can ensure that private correspondence remains private.